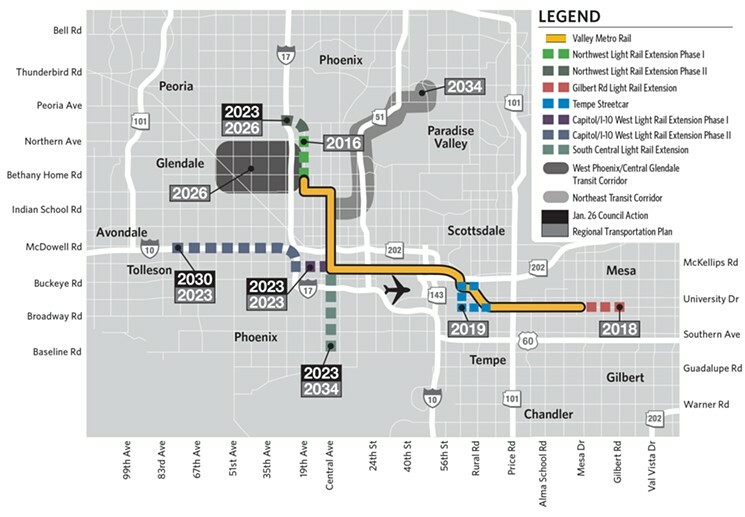 This is a repost of an ARMLS article showing the current and planned expansion of the Metro Phoenix Light Rail that runs from east Mesa to ASU, on to Phoenix Central Corridor and up to west Phoenix at 19th Ave. A connector line was added to give SkyHarbor air passengers access to Light Rail and downtown Phoenix. Street Car service will be added in Tempe to enhance the use of public transportation around the huge ASU campus and Tempe Town Lake areas. An important extension of the Light Rail down Central Ave. will serve the needs of county, state and federal employees and the burgeoning warehouse district further south. The South Central Avenue corridor is attracting young, skilled and imaginative employees to the opportunities of numerous Dot Comm startups who relish living and working in an eclectic warehouse district that inspires anything-is-possible, free-spirited innovation. By 2030 there will be a spur added along I10 to the vast west side of town. Those folks out there west of town need help with commute challenges. Hope Light Rail can be expedited for them. Another spur will be added from the Central Ave Corridor northeast along Highway 51 by 2034. 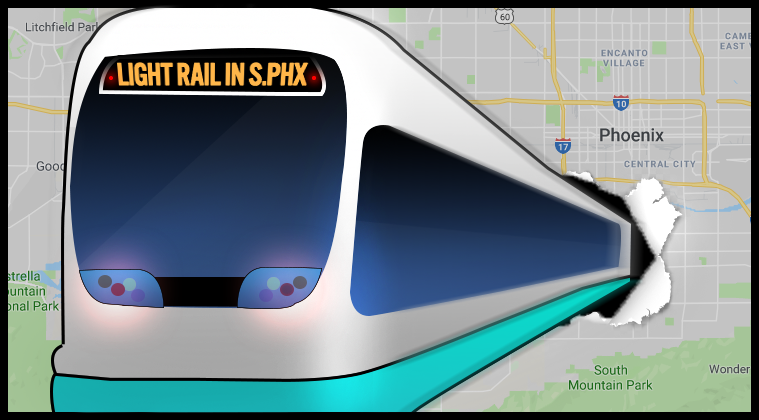 Its been 6 years now since we first began the South Phoenix light rail conversation. The 5.5-mile extension would run down Central Avenue from Washington Street to Baseline Road and connect South Phoenix to Downtown. After voters approved Proposition 104 in 2015, a $31.5 billion transportation plan, the city put the nearly $1 billion project on a fast track. We in Phoenix, like most cities in the U.S., have commute congestion. Commuting around Metro Phoenix, as the 5th largest city in the U. S. with almost 1.7 Million inhabitants, is extremely challenging. Research where you are likely to work and want to buy a home. Hopefully, both will be in close proximity, so your commute will always be acceptable. I can help you find your ideal home near where you need to be once you determine where you are likely to be working. For additional information about Phoenix AZ, an individual school, your child's special needs or course instruction, please contact the appropriate school principal or the district office. Please contact Sam Elam to assist you in finding your ideal home for sale in Phoenix AZ area that meets all your criteria in the neighborhood that provides you the quality of life with the amenities you desire. If schools are important to you, I will customize your home search to include only those homes for sale in the Phoenix AZ area with School Report Card Grades of A or B and all the home features in the location you desire. Let's get started! Sam has 28+ years of residential real estate experience. Learn more about these cities in his service area: Chandler, Gilbert, Mesa, Phoenix, Scottsdale, Tempe AZ, Arizona retirement communities and investment property. Sam brings his vast real estate experience to help you decide which home is your best choice based upon your criteria for the perfect home. Call: 480-213-1799 or Contact Sam with questions.